The best vegan soul food I've ever had has been at Souley Vegan in Oakland. This is the land of soul where fried chicken meets its match with fried tofu cooked to perfection. Since 2006, the owner, Tamearra Dyson, has been serving her community healthy vegan options (um, other than the deep-fried options) and has been amazed at the impact she has had. Now her customers come from all walks of life and include vegans, vegetarians, and omnivores. This was our first time returning here in years and we were pumped. The outside facade is an unassuming white stucco building with a large sign that stated, "Souley Vegan - Vegan Soul Food," on it. The inside, however, is very warm and inviting with bright red walls and eclectic artwork showcasing African American legends. The front half is more of a cafe setup while the back half is more of a bar setup with a full bar. We grabbed a menu from the front and began perusing. I ultimately decided to order the 3-item sampler while Zach ordered a sandwich and fries. We took a seat and awaited our order. 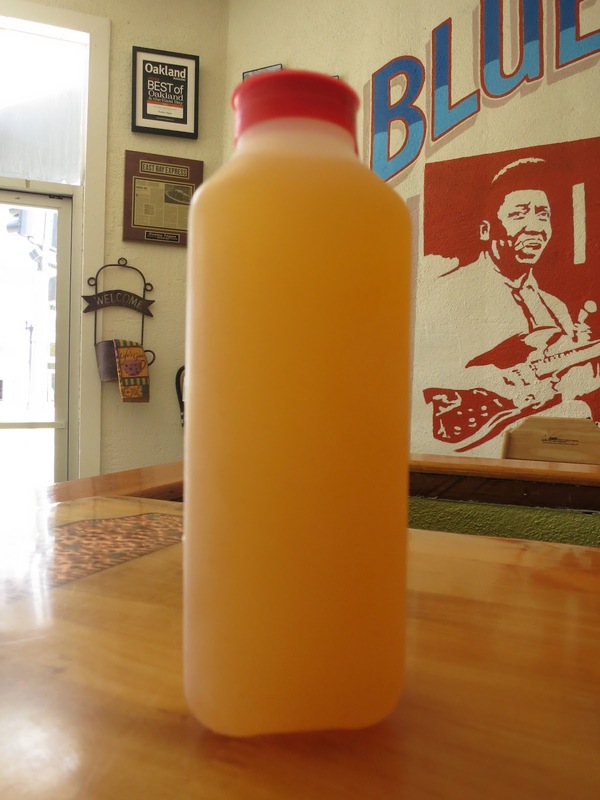 I started with a cayenne lemonade that came in a plain plastic bottle. I loved it. Zach ordered a tea. My three-item sampler consisted of two pieces of southern fried tofu, macaroni and cheese, and greens. This was a meal fit for a queen. There are no words that can describe just how good this southern fried tofu is. I don't know how they do it, but they take a large block of tofu and deep fry it in a special batter that produces this thickly crusted tofu that is absolutely delicious. Zach had the same tofu on a sandwich, which he preferred over mine. It is served with a garlic alioli and hot sauce -- the perfect condiments. On the side were some mustard greens cooked with fresh onions, herbs, spices, and fresh sauteed tomatoes. So good. Also served was a macaroni and cheese made with rigatoni noodles and a nutritional yeast-based cheese. The mac and cheese was very hearty. Zach ate his sandwich and fries up like there was no tomorrow. Even the seasoned fries he ordered were exceptionally good. Unfortunately, it was so filling that neither of us had room for dessert. The desserts looked amazing though -- cakes, cupcakes, and cookies that are all made in-house. I'm not quite sure how healthy the entire meal was. I mean, I think the mac and cheese and greens were pretty healthy, but the deep-fried tofu - not so much. But, you know, sometimes you have to live a little. The meal was a bit pricey at $11 for my plate, but certainly not overpriced. If you are anywhere near the East Bay, you have to come try the soul food here. I promise you won't regret it.